We invite you on a transcendental journey. 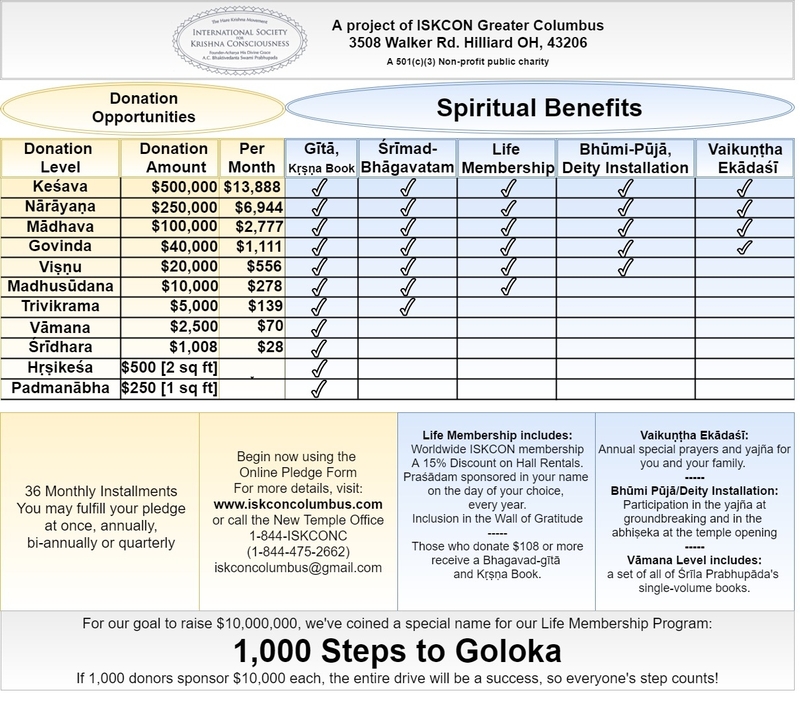 We have been privileged and blessed to serve Sri Sri Radha Natabara and the Columbus community since 1968, in three separate locations, each an ordinary building, each a house, each one similar to our current location. Today, our community has exponentially grown to over 300 committed members. Thousands more come for our festivals whom we have been privileged to serve. The time has arrived for us to build a Krishna temple on the recently purchased 53 acre Hare Krishna Land in Hilliard, Ohio. Our Krishna land will include a temple, Govinda’s cafe, Gift shop, yoga studio, bhakti lounge, event space, library, quarters for resident devotees, guest facilities and many spaces for children to learn, study and express themselves. We hope to showcase Krishna consciousness on a transcendental platform to thousands of families through festivals and offer guided tours to multitudes who would visit seeking understanding and connection with Krishna consciousness. We will have cows on our land, an organic farm, flower gardens, and walking trails. This temple offers a chance for thousands to find fellowship, meaning and purpose in life through engaging in devotional service integrally. Our community will showcase art, music, drama, theater, worship, and in-depth study of genuine spiritual literature. Let’s combine our efforts to raise this temple for Lord Krishna. We need to raise ten million dollars by Spring of 2020 to see this temple open. Anyone who contributes to this project in any way is blessed by Lord Chaitanya and engages in the most important welfare work for all the people of the world—as a matter of fact, of all the living entities of the universe. Being involved in building a temple is a once-in-a-lifetime opportunity to be a part of something beyond the confines of our daily lives, something which is bigger than ourselves and something which will endure for our future generations. By engaging in this endeavor, we play a role, big or small in spreading the inclusive message of Krishna consciousness to every member of our spiritual family. To the extent we try to surrender by offering our precious time, effort and money, we take pride of service to the Lotus Feet of Sri Sri Radha-Natabara. 53 Acres purchased in Hilliard at 3508 Walker Road. 2500 SF Ranch purchased in front of the land. Fund Raising (Target $10 Million).